Posted 12-1-2018 by Andrew Yeager. There was plenty of one thing at the funeral of Emantic “E.J.” Bradord, Jr. – hugs. Volunteers with Rock City Church stood in the lobby of Boutwell Auditorium in downtown Birmingham Saturday morning holding boxes of tissues and offering hugs as funeral attendees entered the building. The service was a celebration of Bradford’s life, but the controversy of how it ended was never far behind. Police in Hoover shot the 21-year-old black man on Thanksgiving night at the Riverchase Galleria. They initially identified Bradford as the gunman before later saying it was “unlikely” Bradford fired the shots that left two people wounded. On Thursday, police arrested 20-year-old Erron Martez Dequan Brown for the shooting. Friends speaking at the funeral remembered Bradford as a loyal friend who could always be counted on. But he was also not above a bit of mischief, such as taking his mother’s car without permission. 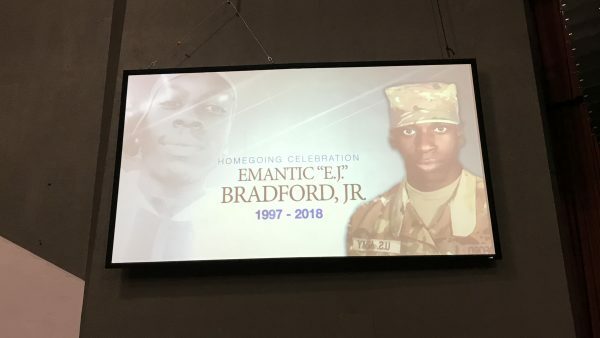 Bradford’s father, Emantic Bradford, Sr., recalled watching Batman marathons on TV with him as a kid. When Bradford, Sr. was diagnosed with cancer, he says Bradford became a caregiver and a great source of encouragement. Bradford’s death has sparked protest and marches calling on police to release body camera video and other footage of the incident. Investigators have so far declined to do so. Protest organizer Carlos Chaverst, Jr. told the audience he will continue pushing police to release video and other evidence. Rev. 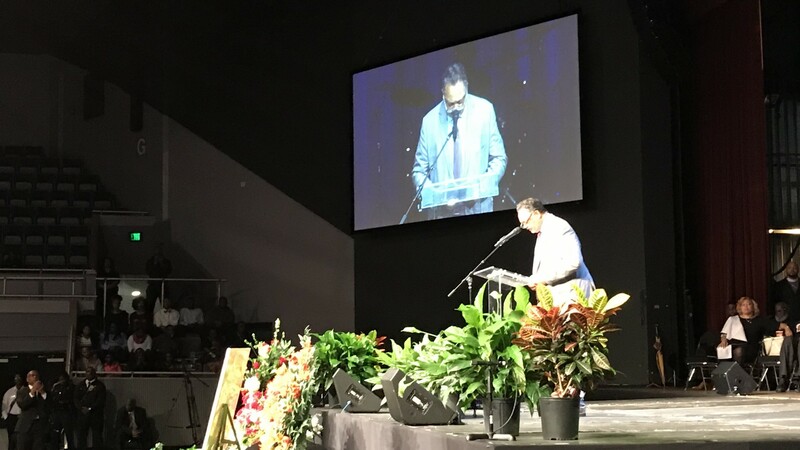 Jesse Jackson delivers the eulogy for Emantic “EJ” Bradford, Jr.
Rev. Jesse Jackson, who delivered Bradford’s eulogy, echoed the call for police transparency. He called Bradford a martyr and tied his death to the history of slavery and civil rights. He also referenced police shootings of black men and shootings at a Pittsburgh synagogue in October and at a black church in Charleston, South Carolina in June 2015.